Result Declaration: The GPAT result declaration date announced officially by All India Council for Technical Education (AICTE) released the GPAT 2018 result on the official website, Candidates can check the GPAT 2018 results here- http://www.aicte-gpat.in/College/Index_New.aspx but tentatively it declared on 15th February. Once the Result is out, the admission rounds take place until the month of April and the academic sessions start in July-Aug. scorecard/Result will be valid for 3 years from the date of declaration of result for admission in PG course. Steps to check GPAT 2018 Result? Click on ‘GPAT 2018 result’ tab. On clicking, you landed on the results page. Click on ‘view GPAT 2018 score’. Enter your email ID and password to view your score. The GPAT 2018 cutoff is usually declared along with the declaration of the GPAT Results. Note: While checking the GPAT result, candidates may face some discrepancies with the server related to the AICTE official website due to tremendous load on it. However, they will be able to easily download their GPAT result after 3-4 hours. Post the GPAT result announcement, candidates advised taking a print out of their respective scorecards for further counselling and admission process. 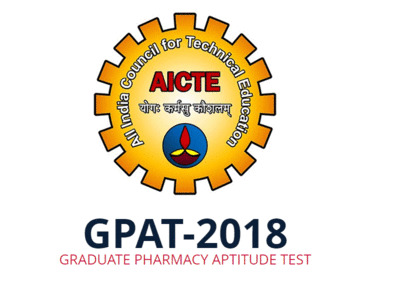 Graduate Pharmacy Aptitude Test (GPAT 2018) is a national level entrance exam conduct by All India Council for Technical Education (AICTE), New Delhi. Every year to select candidates for providing an admission of Pharmacy graduates to Masters (M. Pharm) programmes as per the Directions of Ministry of Human Resource Development (MHRD), Government of India. Candidates seeking admission to Postgraduate Pharmacy programme in the top pharmacy colleges in India through the Results. GPAT 2018 result released on the official website of AICTE. Through the Answer Key, candidates get a chance to evaluate their performance well after the announcement of the results. Finally, the GPAT Results announces & the counselling process will tentatively begin from 12th March 2019 at the respective participating institutes. However, eligible candidates are to participate again in the counselling, which conducts after the declaration of result and All India merit list. However, Candidates advised keeping their GPAT result 2018 till the completion of admission procedure. The counselling procedure takes place by individual participating institutes across India. Moreover, the candidates required to carry their original mark-sheets along with other certificates at the time of counselling. If they fail to carry their original certificates and mark sheets their candidature can get cancelled. Note: Particularly, Candidate is not supposed to carry downloaded or duplicate copies of mark sheets and certificates as they are not acceptable to the college authorities. GPAT counselling is to be the last step towards admission process.